Fully self contained stand alone classic Kiwi Bach with a separate sleep-out set in a tranquil rural location.Stunning harbour views with absolute privacy.Warm cosy nights by the pot belly fire,bacon and eggs on the barbie for breakfast. 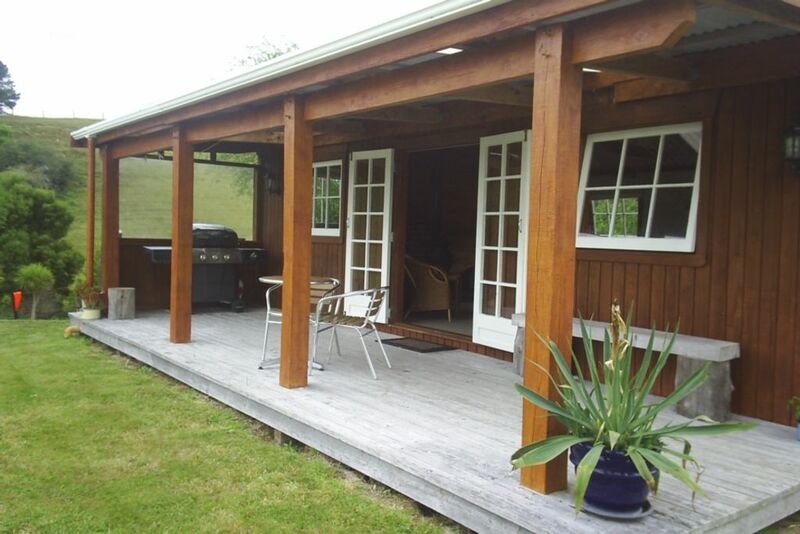 Absolute peace and quiet, abundant birdlife, romantic retreat, excellant fishing.Spotless presentation, Beaches closeby.18ks to Ohope,17ks to Opotiki,1hr 20 from Rotorua Internaional Airport. 30mins to the Awakeri Hot Pools. Price includes Linen, rubbish removal and firewood. Short walk to the old Kutarere Wharf, 8 mins drive to the nearest beach, boat ramp, dig for pipies at the Waiotahi pipi bed or catch a fish at our special fishing spot. Enjoy the many exciting activities this region has to offer.Lots of nearby bush walks.Perfect retreat to just unwind overlooking the water or to enjoy a romantic weekend away from it all. All in one living with separate shower/toilet/changing area. Bach interior has; 1 x queen,1x double and 1 x king single bed. Clean and tidy with fresh linen and a high pressure shower with no water restrictions. Well set up kitchen with a two burner gas cooker, electric frypan, mini oven, microwave, fridge/freezer, new barbecue on deck outside. Tent site next to Bach for extra guests. Apart from cows, we have; tui, wekas, bellbirds, herons, ducks, stilts, pukeko,kereru ( wood pigeon), kingfisher,skylarks,finches and spur-winged plover. 5 minute walk to the old wharf you can watch all the endangered birds that visit the Ohiwa harbour throughout the year. Kiwi watch tours at Ohope, only a 20 min drive away.Lots of nearby bush walks or bring your mountain bike for the Motu cycle way. * Guests must bring their own life jacket for kayak. We purchased this property & built the Bach from timber from our own sawmill. Perfectly sited to look straight down onto the tidal ponds out onto the harbour. Fridge/freezer. Great for long term stays. Quiet large, with freezer pads if you intend to have a picnic at the beach or go fishing. Such a lovely place to stay. Great views and nice and quiet. Cute cottage nicely themed by timber and beautiful outlook over wetlands and harbour. Peaceful plus! This property is well loved and cared for by the owners. Who are a wonderful couple. The view is priceless and the Bach is beautifully set up with everything that you need. My tv loving children didn’t put the tv on once. The Bach felt cozy and spacious at the same time. I would recommend this bach to anyone looking for that peace of quiet and wanting to experience the abundant bird life. We loved it thank you Dianne and Bob. With the help of GPS we found the bach easily and despite the fact we were an hour later than we expected, within minutes of our arrival Dianne appeared to make us welcome. The bach was perfectly clean and ready for us. The setting is gorgeous with an abundance of bird song. We enjoyed three memorable days there and would happily have stayed longer had time permitted. Great Batch in Idilic location.